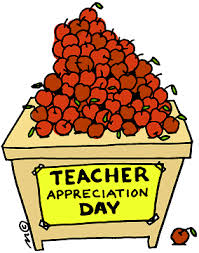 As easy as it is to support the notion that parenthood really should be a year round celebration not just relegated to Mother’s Day and Father’s Day, it’s just as easy to justify teachers also deserve year round celebration beyond Teacher Appreciation Day as well. After all, they are with our children 7 hours a day, 180 days a year, and if parenting is the hardest job in the world, then teaching has got to be the runner up, don’t you think? The fact of the matter is these designated days are necessary place markers on the calendar lest a year pass with no celebration at all. So, Tuesday, May 5th it is and celebrating our children’s teachers is where the creativity of parent organizations seems to have no bounds. We are good at this. Just google “teacher appreciation day ideas” and you will get 5 million results (no kidding). Whether we celebrate our teachers with homemade or store bought presents, breakfasts or lunches, activities in or away from school matters less than the heartfelt gratitude behind the actual celebration. Our teachers, like all of us- parents and children- also need words of encouragement and appreciation. These words whether delivered on a given day, like my Mother’s Day card, or spread throughout the year are what really count. So, just like we remind our children to say their thank yous, now is the time to remind parents to say theirs. Several years ago when my youngest was in 6th grade I gave this card to the teachers on her team. It was a year’s worth of cummulative thank yous.